Lifetime Warranty: Fiberglass arbors will not rot, warp, bow, or become infested with termites. Fiberglass pergolas have become the industry standard for pergolas used to make lasting impressions on residential and commercial properties. Wood gets infested with termites or rots and splits. Vinyl or plastic pergolas are quickly broken down by freeze and thaw cycles. The vinyl products come with cheap looking snap on tails and are very limited in color and style options. The low heat distortion index associated with vinyl arbors (178 degrees) will result in distortion and the emission of toxic gases when installed in close proximity of fire pits or grills. 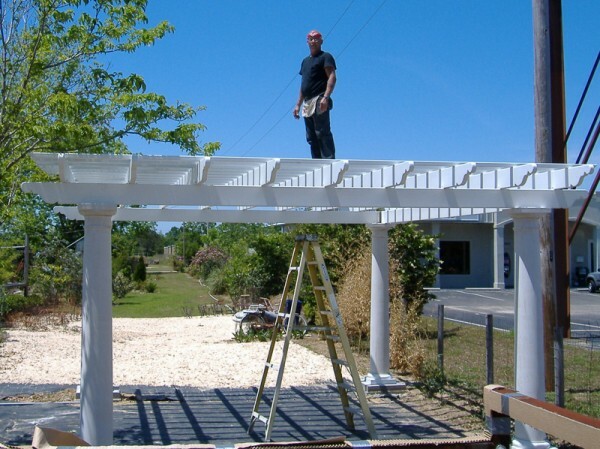 Aluminum pergola kits appear lifeless due to few or no color options and the simple nature of the material. The product is easily dented with hail or other light impact. Fiberglass pergolas on the other hand are pound for pound stronger than steel without the added weight. Our products are available in standard white or virtually any color imaginable. We have several tail options that are part of the rafter and not a flimsy attachment. Each rafter can span up to 22’ between columns for a total span of 26’ while plastic can usually span a maximum of 12’. Our arbors will not rot, warp, bow, or become infested so the clear winner is fiberglass through and through.